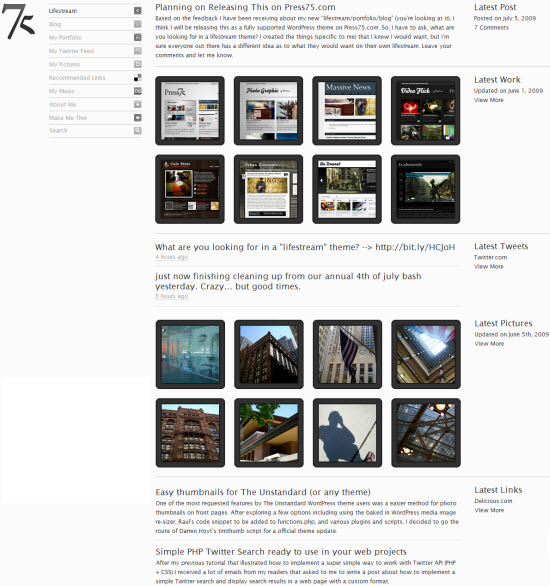 Jason Schuller runs the premium WordPress theme site Press75.com. He recently created a nice Lifestream for his personal site. Based on the feedback received, he’s decided to create a fully supported premium version for WordPress. With this decision he’s called out for feedback to help him design it. So, I have to ask, what are you looking for in a lifestream theme? I created the things (specific to me) that I knew I would want, but I’m sure everyone out there has a different idea as to what they would want on their own lifestream…I probably will be making use of several plugins (recommended and required), but I want to put a list of functionality together so that I can style as much as possible to match the theme. You can check out Jason’s Lifestream page here and provide him with feedback on his impending theme design here. The presentation layer isn't using the calendar metaphor! Any chance on a open source theme coming up?